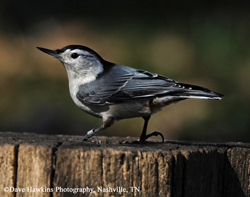 Among the species in Sittadae family, the White-breasted Nuthatch is the largest and most common in Tennessee. It is small, yet conspicuous, because of its habit of creeping headfirst down tree trunks and around branches, stopping to crane its neck toward the horizontal, then continuing to forage on the bark crevices. This is a common visitor to feeders and will occasionally nest in nest boxes. A small bird with a large head, very short neck, and long, narrow bill. Blue-gray on the back, white face with a black cap and neck that make it look like it is wearing a hood. The breast is white and the flanks are rusty as are the undertail coverts. The White-breasted Nuthatch is found in open woodlands with mature deciduous trees. It is common in suburbs and urban parks with large trees. It eats insect larvae and spiders, but also seeds and nuts. In Tennessee, breeding activity begins in late winter in the bird’s permanent territory when the male begins to sing and display for its mate. The female selects a natural cavity, sometimes excavating with her sharp bill to increase the size of the entrance hole. 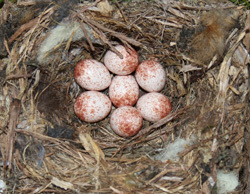 She builds the nest, lining the cavity with fur, twigs, and feathers, then making a cup of grass or shredded tree bark. She may use this nest in subsequent years. Incubation period: Female incubates for 12-14 days and is often fed by her mate. 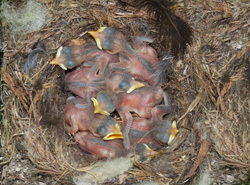 Nestlings fledge after 13-15 days and often remain with their parents until the fall. Nuthatches gather and store nuts and seeds, jamming them into tree bark and hammer or "hatch" the food open with their bills at a later time. The reasons nuthatches forage by climbing down trees are not fully known, but it may be that they can spot prey hidden from creepers, woodpeckers, and other upward-facing feeders. White-breasted Nuthatch eggs (left) and young (right). Photos by James Hurt. Preferred box design for White-breasted Nuthatch is slightly smaller than the NABS Eastern Bluebird box with a 1 ¼ inch entrance hole. This box design may also be used by Carolina Chickadees, Tufted Titmice, House Wrens, and Prothonotary Warblers. To attract White-breasted Nuthatch, place your box in a more wooded area than recommended for Eastern Bluebirds. Place the box near woods, shrubs, and thickets, which are used for foraging and hiding from predators. Farms or barnyards where animals are fed are not recommended sites for boxes because these are attractive to House Sparrows. Avoid placing your box where pesticides or herbicides are used. Mount the box so that the entrance hole is about 5 ft. from the ground and facing, if possible, to the east, away from direct summer afternoon sun and from north winds that may drive rain into the box. A tree or shrub that is within 100 feet of the box will provide a perch for the adults and a safe spot to land for the fledglings' first flight. If you plan to put up multiple boxes in an area, we recommend placing boxes at least 100 yards apart to reduce competition between White-breasted Nuthatch and other species.